Brenda Jagger was born in Yorkshire like so many of the characters in the Barforth Trilogy. Married with three daughters, she worked in Paris, Dundee and then in the north of England as a probation officer. Her work with 'wayward girls' and her own family increased her interest in women's experiences, both within her own lifetime and historically. 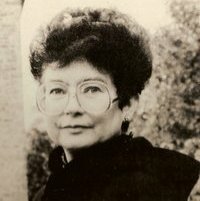 In 1986, her last novel A Song Twice Over won the Romantic Novel of the Year Award by the Romantic Novelists' Association.